Three years ago today 10-man Raith Rovers earned a 2-2 draw at a snow-bound Falkirk Stadium. The club had won just once in 12 league games but this result helped kick-start the Championship promotion play-off push under Ray McKinnon. RAITH Rovers may be a team in need of a win, but the 2-2 draw in the snow at Falkirk Stadium this afternoon was a welcome point. Rovers twice fought back from a goal down to end a five-game goal drought, then survived a late onslaught after being reduced to 10 men to earn their first point against the Bairns this season. Falkirk held the upper hand for most of the first hour, but the Kirkcaldy side had turned the tables and were pushing to win the match when defender Kyle Benedictus picked up a red card for a two-footed tackle in the 83rd minute. To make matters worse, Raith played most of the remaining time when nine men when substitute Jason Thomson was forced off with a bloodied nose, and prevented from returning to the pitch by the officials despite changing shirt several times. Raith dropped to fifth and are now just one win in 12, but this was a resilient performance, and one that should help to restore some confidence ahead of a busy run of key fixtures. After 10 days without a game, Raith manager Ray McKinnon freshened up the starting XI with a first start for Leicester loanee Harry Panayiotou and a recall for James Craigen. Dropping out were Iain Davidson, who missed the match due to injury, and Louis Longridge, who had to make do with a place on the bench. Strong and comfortable in possession, Panayiotou showed enough in his first 90 minutes to suggest that he could add something different to the Raith attack. There were also signs of a potential strike partnership with Mark Stewart, who looked much more dangerous than in recent weeks playing on the shoulder of the last defender. Most impressive for Raith was young Aidan Connolly, who sparkled in possession, particularly in the second half when he was the chief creator when the visitors were on top. Wintry flurries meant the artificial pitch had a covering of snow as kick-off approached, but with the lines cleared and the ball travelling freely, the match was given the green light. The slippy underfoot conditions certainly made life difficult for the players, with the Raith defence looking particularly unsettled during the opening 45 minutes. After his midfield role against Rangers, a return to central defence for Lewis Toshney restored the centre-back partnernship with Benedictus that was so impressive in the early stages of the campaign, but Davidson’s absence was felt during an uneasy opening half hour. Toshney was caught on his heels in the sixth minute as Craig Sibbald raced through on goal but right back David Bates saved the day with a last ditch block. Raith also showed a determination to attack and Connolly teed up Stewart at the edge of the box on nine minutes but the striker’s curling chip over Danny Rogers was just too high. Falkirk took the lead on 15 minutes with a clever move that saw striker Lee Miller dropped off the front to thread a through ball to midfield runner Blair Alston, who burst through a static Raith defence to clip an effort past Kevin Cuthbert. Raith had a similar chance to equalise within 60 seconds as Stewart broke through the Bairns defence only for Rogers to turn his effort behind for a corner. The equaliser was only delayed however as from Connolly’s corner, Alston’s attempted clearance ricocheted off Craigen and skidded into the net via the inside of the post. A fortunate goal, but a relief for a Raith side that hadn’t scored since Craigen’s last minute penalty kick winner against Morton on December 18. Falkirk went back on the attack and Cuthbert made a smart save at his back post to keep out a downward header from David McCracken from a Mark Kerr free-kick. The warning went unheeded as the same players combined to put the hosts back in front on 20 minutes as Raith failed to attack Kerr’s free-kick delivery, and McCracken bulleted a header into the top corner. After a frantic start, the game settled down towards half-time but Falkirk remained in the ascendancy with Toshney blocking a goal-bound Sibbald header to prevent the Bairns from taking a two-goal lead into half-time. The opening 15 minutes of the second half saw Falkirk up the pressure further and only a last ditch tackle from Benedictus prevented Sibbald from a clear run on goal after Craigen’s pass to the defender fell short. There was then three chances in as many minutes for the hosts as Ross Callachan cleared off the line to deny Paul Watson’s near post flick from Kerr’s corner. Ex-Rovers striker John Baird then broke the offside trap to go clean through but Cuthbert was equal to the effort, blocking his powerful strike with both hands. Raith needed changes and Ray McKinnon obliged with a double substitution, replacing Bates and Craigen with Thomson and Longridge. The game changed almost immediately as Thomson hit the by-line but his cut-back was cleared, before Longridge set up an attack that saw Stewart flash a dangerous ball across goal. Raith claimed a penalty on 67 minutes as Stewart tumbled in the box attempting to reach Connolly’s pass but just a minute later the striker grabbed the equaliser. Benedictus broke from defence to play a ball over the top that saw Stewart break the offside trap before sending a cool, crisp finish beyond Rogers for his seventh of the season. Falkirk were now wilting and Raith sensed victory. Connolly was a constant threat and his clever ball released Stewart again but this time the striker unselfishly squared for Panayioutou but the pass was cut out. Raith pressure was building until, with seven minutes left, referee John Beaton raced towards Benedictus holding his red card after the Raith defender crunched into a two-footed tackle on Falkirk sub Myles Hippolyte. The defender pleaded his innocence, and he may have won the ball, but the tackle certainly looked reckless. It was the third successive red card Raith have received at Falkirk Stadium with Benedictus also sent off earlier in the season, while Liam Fox was ordered off at the tail end of last season. 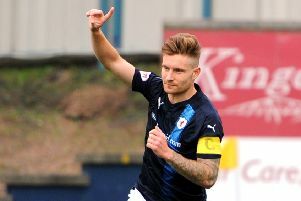 Unlike previous occasions, Raith held on for a point as late Falkirk pressure failed to produce a winning goal, despite Thomson spending most of the last five minutes on the touchline as Raith’s medical team frantically tried to stem the blood flow. Raith boss Ray McKinnon said afterwards that felt his team could have won the match were it not for Benedictus red card. "I think we could have got more out of the game, " he said. "I’m disappointed with the goals early on - we sat off them a bit. "But fair credit to them - they went about their business well in the second half and I’m delighted for them. "We’ve been putting in performances weekly and not getting our just rewards so it was nice to get something out of the game." Falkirk: Rogers, Muirhead, Watson, McCracken, Leahy, Alston (Hippolyte 71), Vaulks, Kerr (Taiwo 80, Sibbald, Miller, Baird (McGrandles 70). Not used: Smith, McHugh, Mehmet, O’Hara. Raith Rovers: Cuthbert, Bates (Thomson 62), Toshney, Benedictus, McKeown, Craigen (Longridge 62), Robertson (Matthews 77), Connolly, Callachan, Stewart, Panayiotou. Not used: Anderson, McCord, Court, Law.